I believe that you have the strength not just to survive, but to thrive! Jessica-Lauren’s unhealthy obsession with calories and exercise in college led her to complete the very degree which allows her to do the work she’s so passionate about today. 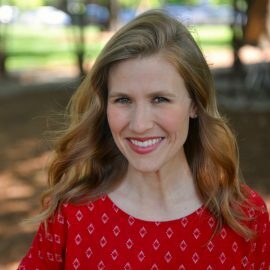 She is currently finishing her doctorate at Auburn University where she has been providing nutrition services since 2010; she serves as the dietitian for the Eating Disorder Treatment Team, runs a support group, and mentors dietetic students. Her husband and daughters are the highlight of her life. She enjoys small group ministry, cooking, eating, reading, running, and snuggling her rescue dog. She craves slow mornings complete with a warm blanket, creamy latte, hot fireplace, Spirit-filled worship music & unlimited time to soak in the Word. I believe in full recovery because I represent it. I believe that God is the ultimate Healer, and He has empowered and equipped us to experience full recovery walking in community with others who have been called and equipped to help us in our Journey. He provided redemption and reconciliation on the cross through Jesus Christ. He comforts, prompts, and guides us through the Holy Spirit. It is my honor and privilege to do this work and watch Him set captives free!